Jungle Jim Magazine #12 (May 2012). Pp. 34. ASIN B00839I6WY. $2.99. Jungle Jim is a fascinating magazine to me, for two reasons. First, it is wholly African in origin, and although it is published worldwide (as anything can be in this wonderful digital age), its heart, soul, and papers themselves are all African. It is fiction and ideas from another place, about another person’s home. It’s a form of lazy world-travel. The second reason is that Jungle Jim is a particularly distinct magazine, in every sense of the term. It is visually distinctive, the voices contained within—whether the stories work or not—are very entirely themselves. It doesn’t feel like other magazines. It reminds me of nothing so much as Alan Moore’s underground magazine Dodgem Logic, and indeed Jungle Jim reminds me of all the other magazines which inspired it. It feels like it could’ve been an underground magazine in the 1980s, and that’s exciting. It has a punk-rock atmosphere about it, at least to me. But enough about the overall magazine itself. The issue I’ve read and want to talk about is issue number 12. It’s a fairly short issue: there are only four stories in it, and indeed one of those four is not even completed in this issue. The first story up is ‘Confessions to a Crime: part 1’ by Clarius Ugwuoha, and my major problem with this story is right there in the title, but we’ll come to that in a moment. In this story, a young woman named Nadine grows up enraptured by a young man in her village named Blue Joe who is young and fiery, but also quickly enmeshed in a world of crime, something Nadine is sadly the last to notice. I wound up with two problems with the story. One problem is that remarkable though the voice of the story is, the piece puts most of its weight on the rhythm and language, thus leaving characters and landscapes to be touched upon in only the broadest strokes. I was more than halfway through the story before I began getting a concrete image of Nadine and Blue Joe and their lives. My second problem is that this story only begins in this issue, but continues on in, I assume, the next one. I normally don’t mind this at all, having done a goodly amount of serialized fiction myself and being quite fond of the form. My problem here is that the story takes some time to get going, and then ends without any type of conclusion or cliffhanger, not even a momentary one. It ends at what feels like a break between two paragraphs, nothing more, leaving me with nothing satisfying in this piece. As such it’s hard to fully judge the story. It may be that taken as a whole, I would really like it. As it is, I have no idea. The next story is ‘Twin Sisters’ by Constance Myburgh, and this one I found entirely satisfying. Looking for his brother, Fransie, who has just been let out of prison, Adam journeys to the town of Twin Sisters, in which a woman keeps guests in her house, some of whom never leave. It’s a very classic story, both in its method of telling and its subject matter. There is a monster in the story, and the whole piece might have fallen into cliché had she not been so well-executed. She was dangerous and spooky, and also very original. What she does to her victims is fascinating, I thought. I also liked the method of telling this little monster story, in that it’s being told to us by someone who heard it from someone else, in the classic fashion of retelling old ghost stories. I have a great weakness for this kind of ghost story, but it’s the originality of the piece that makes it stick in my mind and makes it well worth the read. My only real complaint with the story was the illustrations that accompanied it. They were fine enough all on their own, but I really thought they jarred with the story. They were louder and more aggressive than the story they accompanied. It’s like a techno soundtrack on top of a Alfred Hitchcock film. Both wonderful, but they aren’t helping each other out. Onward, then, to ‘Escape to Hell’ by Iheoma Nwachukwu. About this one, I have very little to say, but that’s not through any fault of the story. 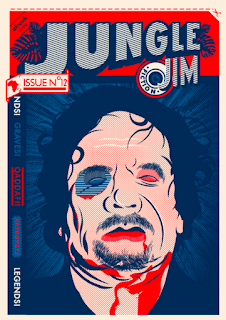 This piece is a cassette-recorded rant from now-dead General Qaddafi as he cowers in a sewer and awaits the inevitable. The story takes a page or so to get into, because it takes that long to fully realize what you’re reading and fall into the rhythms of it, but once you do it’s exhilarating. The ramblings are not only urgent and aggrieved, but best of all they’re truly disjointed in the way of someone becoming mentally unhinged. It’s a special quality to the thoughts and speeches of people in that collapsing state of mind, one I have encountered many times in research for a project I’m working on. Being familiar with it elsewhere was what left me so impressed with its execution here. It’s a razor-sharp, riveting piece, and I have so little to say about it because I have no complaints, and nothing to express but pleasure. My favorite reasons to have little to say. Finally, the issue concludes with ‘The Deaths of Old Graham,’ by Abdul Adan. In this one, Old Graham ails and passes away in his bed, which would be all well and good if he didn’t keep coming back to life, ailing and then dying some more. At the same time I was reading this, I was listening once again to the audiobook of Neil Gaiman’s Anansi Boys, read perfectly by Lenny Henry. I mention this because the short story has the excellent tone of a folk tale being told and I couldn’t help but hear the whole thing in Lenny Henry’s voice. Wrong accent, surely, but it still worked beautifully in my head. This story particularly works well for coming after ‘Escape to Hell’, which was very fast and very intense. This feels like a cleansing conclusion to the issue. It’s a simple story, as a folk-tale-style piece should be, and I really liked it. My only complaint was that it came to a very abrupt end, one which didn’t seem to fit the almost laconic pace of the rest of the story. I have to say, though, it’s a minor complaint, in that it didn’t hurt my enjoyment of the story overmuch. This then, is Jungle Jim issue 12. Some good, some bad, and a style all its own. My major thought, reaching the end of the magazine, was that I wish there’d been a lot more of it. Happily, that’s an easily problem to remedy with magazines. It’s called a subscription.